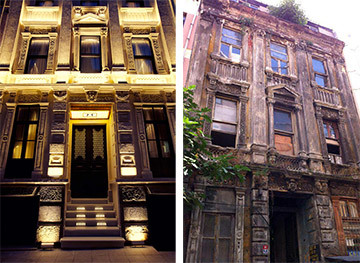 Our hotel is situated at the heart of classical and imperial Istanbul. Our building was surrounded by imperial palaces and stately homes of Ottoman higher bureaucracy. If you walk through our street to the left you will cross the mosque and tekke of Molla Fenari who was a Sufi, giving the neighbourhood a mistical aura. The building itself built in 1875 as an intellectual club of Ottoman modernizing elite. The building then was used by the local government, served as a court. Afterwards, it became a gendarme station, school, newspaper bureau and finally as a business center. Conscious of its historical nature we renovated the building as a hotel. We are proud that we preserved the ancient architectural style and interior.